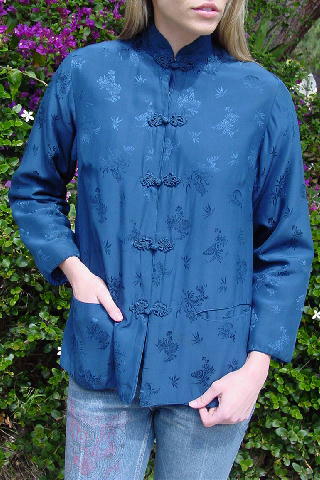 This vintage 100% silk jacket was made in Shanghai, China. It's in a deep royal blue with a tone-on-tone floral, leaf, and Chinese vase design. 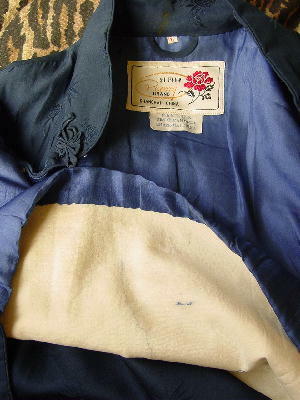 There are two silk-lined open lower front pockets. It has 5 fabric buttons and loops, four snaps, and one eyehook down the front. The button and loop designs have copper wire supports. A few strands of the wire are visible on the 3rd and 4th loop designs, which only adds to its charm. There is a dark age spot at the right front bottom below a leaf design. The back inside collar lining has a rust mark outline (from years of being stored on a wire coat hanger). There are some worn spots on the lining of the left sleeve. 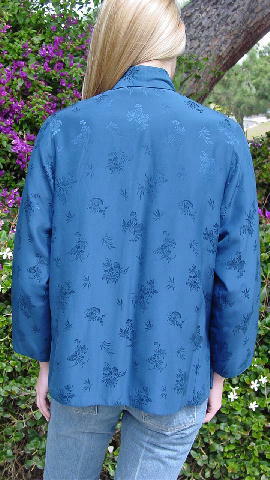 It has a deep periwinkle blue silk lining, which is backed by a thick soft antique white backing. It has a mandarin collar, and 2 side seam 4 1/2" slits. It's a great jacket, soft and thick. The tag says it's size XL, but it's much smaller. It fits like a size Small. It's from a New York model Eden roomed with who needed the money. She got the jacket from her grandmother. armpit to armpit 19 1/2"